These Thank You Note Cards are perfect for sending to guest who recently attended a special event of yours. These cards feature an elegant silver foil pinstripe design on the front cover that is sure to impress any recipient! 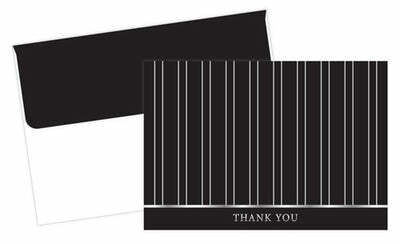 Our Thank You Note Cards measure 4.875" x 3.375" and come pre-folded are are packaged in an acetate box. The thank you note cards are made from a 100 lb Text (147 gsm).